Sometimes I wish I were living in a simpler time, like maybe the years B.C. Before Cables, that is. Still, life in those days had lots of advantages, the chief one being that folks seemed to get along quite nicely without having a single cable running anywhere in the house. I know this seems incredible. I mean, back then, women’s hair would dry all by itself, without the need of any mechanical assistance whatsoever! Compare that to modern times, when my wife needs a separate piece of luggage when we travel, just for her blow dryer. Today, the average modern household has hundreds of different types of cables running around, over, under, and through it, and that’s just so we can make toast. We have USB cables, HDMI cables, serial cables, parallel cables, perpendicular cables, and all sorts of other cables—each one made for a very specific use. And the number of different cables increases exponentially with each passing year. Think about it. Back in the sixties, your average television required only two cables—one for the power, and one for the antenna. Today, the back of a typical home entertainment center resembles the switchboard at a Fortune 500 corporate headquarters. Consider just power cables for a moment, but not any longer than a moment, lest you become driven to wrap one around your neck and pull tightly. That’s about all that most of the power cables in my house are good for at this point. I have them collected in a large bin in a closet under the stairs. It used to be that when you bought something like a hi-fi, the power cable came permanently attached to it. This was a novel idea, in that there would be no mistaking what cable went to what device. But, somewhere along the line, the device makers, in league with the powerful cable-industrial complex, deemed this as way too simple a concept for the modern age. And so now, virtually all electronic devices come with detached cables, all of which are physically incompatible with any other item except the one it came with. This is what let to the bin under the stairs. 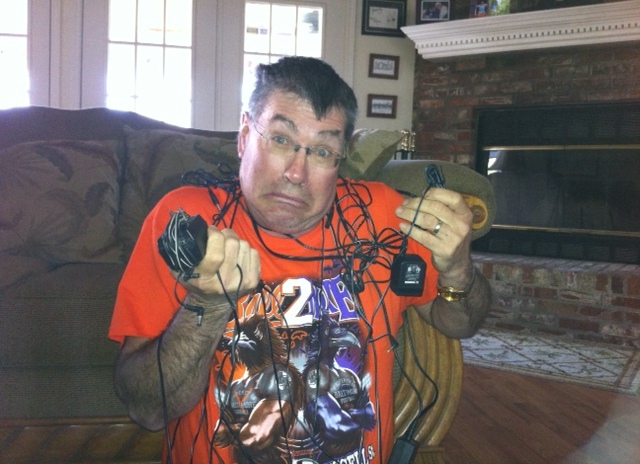 In it are enough cables to power a Super Bowl halftime show, if I could only figure out what any of them go to. Most are probably for things that I’m sure I’d discarded years ago, but still, I can’t bring myself to toss any of them. It’s like maybe, by some miracle, one or more of them will be happily re-united with its master, thus to live happily ever after, as if life happened just like it’s portrayed in one of those boy-and-his-dog movies. But life is not really like that. No, it’s more like a country song where the cowboy goes looking for his long lost love, only to end up in some big city, arrested by police who have mistaken his belt buckle for a stolen manhole cover. Yet still, I hold onto these cables, believing that someday I’ll find a good use for them. Anybody got any ideas, hopefully before a camera crew from “Hoarders” shows up at my door?